Dué Guidry Piedrahita Andrews L.C. specializes in Admiralty & Maritime Law. Anything that happens on or near any body of navigable water may well call forth the admiralty jurisdiction of the courts and the application of the national maritime law. Any lawyer who practices in an ocean, river, lake, or port city is likely to run into admiralty problems. The Baton Rouge, Louisiana admiralty and maritime injury lawyers at Dué Guidry Piedrahita Andrews L.C. are no strangers to admiralty and maritime negligence and unseaworthiness claims, and understand the extension of admiralty law to other types of claims. Serious accidents on any type of vessel, including a crew boat, supply boat, a crab or shrimp boat, a cargo ship, barge, jack-up rig, jet-ski, air-boat or other pleasure or recreational boat may be covered by the admiralty or general maritime law. The Mississippi River and Gulf of Mexico are navigable waters, as are many other rivers and waterways throughout Louisiana. Port cities such as Lake Charles, New Orleans ,and Baton Rouge see thousands of vessels and hundreds of millions of cargo tons each year, with the Port of South Louisiana in LaPlace handling the largest amount of shipping of all U.S. ports. Serious injuries and deaths are common in these high ship traffic localities. The term "admiralty" may conjure up images of antiquity, but the practice of maritime law is a thoroughly modern matter, and you need an experienced maritime law firm to help you navigate the troubled waters surrounding most admiralty and maritime claims. It is essential that early investigation be conducted to determine the law applicable to your claim. 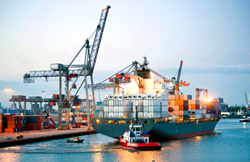 Whether the claim is covered by the Jones Act, DOHSA, LHWCA, the OCSLA, or by the general maritime common law can have a dramatic impact on the remedies available to a seriously injured victim. Our Baton Rouge, Louisiana admiralty and maritime injury lawyers have handled hundreds of claims involving seriously injured or killed maritime workers, including those covered by the Jones Act, the Longshore and Harbor Workers' Compensation Act, the Death on the High Seas Act, and the Outer Continental Shelf Lands Act; injuries to ship passengers and recreational water users; collisions between vessels; and the Shipowners' Limited Liability Act. Our experienced admiralty and maritime attorneys have handled maritime cases not only in Louisiana, but in California, Texas, Mississippi, Florida, Hawaii, and elsewhere. Our admiralty and maritime trial lawyers have represented the families of workers on numerous ships lost at sea, and our reputation in the international maritime community led to our Louisiana law firm being retained to represent the families of five Turkish naval officers who were killed, and the remaining Turkish naval officers who were seriously injured, when the U.S.S. Saratoga accidentally launched two live Sea-Sparrow missiles that struck the TCG Muavenet during naval exercises in the Aegean Sea. Whether you or a loved one was seriously injured or killed on a spud barge, a movable rig, a cargo vessel, or by the maritime unseaworthiness of a vessel or the maritime negligence of its crew, contact the experienced Baton Rouge, Louisiana admiralty and maritime injury lawyers at Dué Guidry Piedrahita Andrews L.C. to schedule a FREE CONSULTATION.